GriefShare is a biblical, Christ-centered grief support group ministry. Our resources help you equip a lay-led team for effective and ongoing grief ministry at your church. GriefShare helps group members apply biblical principles to the healing process after the death of a loved one. Throughout the videos and workbook, participants see how the gospel brings hope and restoration. Since 1996, GriefShare has equipped more than 17,000 churches worldwide. The GriefShare materials feature 46 leading Christian experts on grief recovery topics. Read about GriefShare’s history. Lay volunteers are equipped with tools to recruit and train a leadership team, publicize the group, and start an ongoing grief ministry. Teaching ability is not required, as the GriefShare videos provide biblical instruction from trusted experts. Pastors, church staff, and lay leaders report that GriefShare is consistently effective in helping grievers rebuild their lives. As group members heal, some desire to assist in leading GriefShare, creating the potential for a self-perpetuating ministry. Churches, family, and friends encircle the griever in the immediate days surrounding the death of a loved one. GriefShare is designed to help churches continue ministry in the long months after the funeral, when those around the griever return to “normal” lives. The GriefShare kit has everything needed to start a new ministry: leader recruiting and training, promotion, weekly video sessions covering major grief recovery topics, group discussion guides, participant workbooks for daily Bible study, and free ongoing support for leaders. Many churches report that over 85% of group attendees are not from their church, and half do not have an active spiritual life and are not followers of Christ. GriefShare becomes a great entry point for group members into the life of your church. GriefShare provides free, ongoing phone and email support through our experienced ministry coach team. The LeaderZone, our private leader website, provides leaders with additional resources and a forum to connect and share with other leaders. Leading a GriefShare group can change your life. Read our FREE book to discover how. 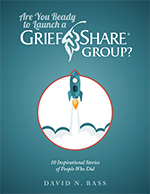 Pastors: Use this book to recruit lay leaders to your GriefShare group!